Sometimes you just cannot take anymore spring goodness. The very act of being outdoors and breathing fresh air is just overwhelming. You have to take a nap. And if you are a 17 year old kitty, well you just do not care anymore what passers-by might think. And so it was today with our aged cat, Captain Hook. I walked out the door to get him and he did not wake. A jet flew over and he did not wake. A loud truck bashed by over the speed bump and he did not wake. 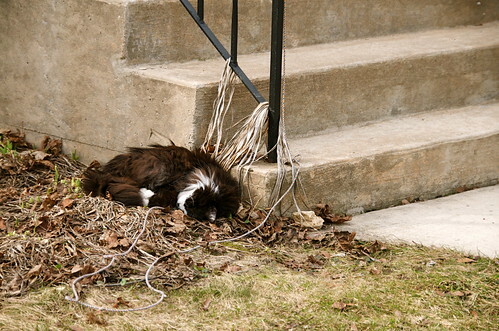 I fetched the camera, took a few shots, went back inside...and he did not wake. He IS alive. I checked to be sure. He is just totally zonked out. Ah, what a life.